Few days ago, we had some friends visiting us. One friend suggested I make ragda pattis for them, I wanted to make something else for starters. Most of these friends are chicken lovers, so I thought of making chicken kababs. 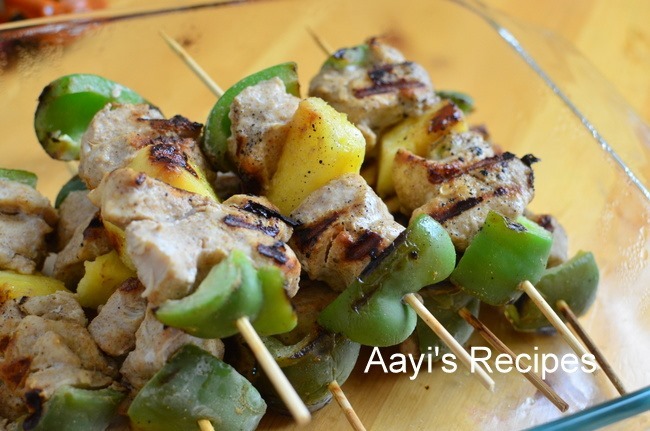 There is something very interesting about chicken on skewers – my family is not a big fan of skewers, but I love the look of them. Just to make them more interesting, I added some capsicum (green bellpeppers) and pineapple to them. 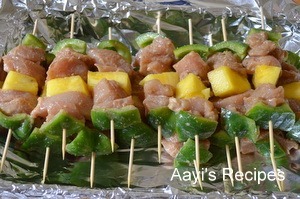 These were so easy to make – the time consuming thing was to put them on skewers and then grilling them. 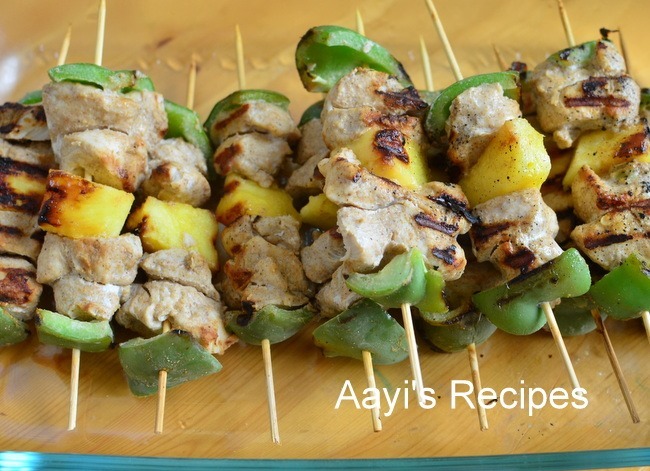 I did skewering while watching IPL match – Ohh, I am a big Rahul Dravid fan and loved watching him bat!.Â I would have baked them, but I had enough time left before my friends arrived. So I went ahead with grilling them on my cast iron grill pan. They went very well with green chutney that I prepared for ragda pattis. They were all gone in minutes. I wish I had prepared more!. Mix together yogurt, ginger garlic paste, cumin powder, coriander powder, chili powder, salt in a bowl. Add about 3/4 th of the marinade paste to chicken pieces and keep aside for 4-5hrs. 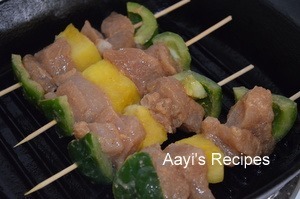 Add remaining marinade to pineapple and capsicum pieces, mix well. Heat a grill pan and grill them till chicken is done. Can you cook them in Griller or on a grill pan…..If cooked in Griller how long do we cook them?